Discussion in 'News' started by Joe, Oct 20, 2017. 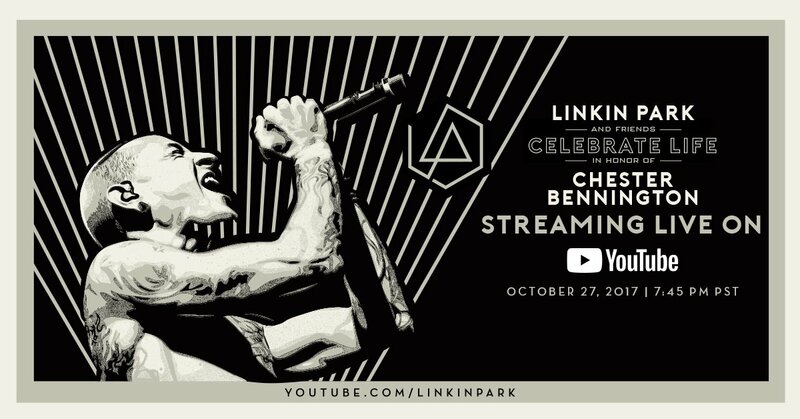 Linkin Park have announced that the Linkin Park & Friends Celebrate Life show in honor of Chester Bennington will be live streamed on the official Linkin Park YouTube channel next week. For more details on this show and for an updated list of acts playing with Linkin Park you can view them here. Jesse, Ree, Sasuke and 1 other person like this. Thats so awesome! I really would like to watch it live in Germany. So its 4:45 am Saturday 28th? Looking forward to it. Not ready to cry but this will be a lovely tribute to Chester. This show is the same day as Super Mario Odyssey release. Alexrednex and CannaKippers like this. I was actually going to ask here yesterday if LP was going to stream this, now it's answered. Looking forward to seeing what the band plays here. Sooo thankful for this. It’s on my birthday and I’ve been trying to figure out how I could watch it. Birthday night plans Confirmed. I am glad that LinkinPark/Warner are going to stream this but I feel it will be quite difficult to personally expunge any overbearing emotions while watching it. So, yeah it's gonna be hard but I'll force myself to watch it. It's also my brother's birthday! It seems like everything is happening on October 27th this year. I'm annoyed Super Mario Odyssey and Stranger Things come out the same day. Even though with the design of the Switch making it possible to do both at once, it's not realistic to take in the experience of both at once as I'd miss things about each. Don't know what I'm going to do on the 27th. Crazy day! You're gonna watch the show. Duh! More like the same day as Wolfenstein 2 releases. A huge day for a lot of platforms. Shame this event is going to be at nearly 4am my time. I'll try to be around for it as it's one of those things that'll be best experienced live, but no promises. Michele and Sasuke like this. I don't care if it's streamed at 3:45am over here, I will be staying up watching this, rocking out and although I'll probably have a tear in my eye or a little cry once Linkin Park are on set without Chester (which will of course be hard to digest) I will definitely be watching this show in its entirety in honour of the great man that is Chester Bennington! Sasuke and Kevin like this.